Patchwork White Jeans by Matteo Biepa. Choose the patchwork white jeans for denim as original as your personal style. Constructed with front and back pockets, belt loops, and zipper fly. Back flap pockets include patch details and black graphic logo. Patchwork white jeans include additional zipper and pocket cargo on thighs. 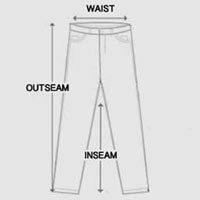 White denim is slightly distressed with several rip details along the leg. Colorful vintage patches give embroidered pizzazz against the crisp white fabric. Features a slim leg for a flattering contoured fit. Rock denim with a retro twist in designer patchwork white jeans.